QUETTA: The Balochistan Union of Journalists (BUJ) has urged the Council of Pakistan Newspaper Editors (CPNE) and the All Pakistan Newspapers Society (APNS) to play their role in protecting journalists threatened by militant groups. Speaking to protesting journalists on Saturday, BUJ president Khalil Ahmed and Quetta Press Club president Raza-ur-Rehman condemned the killing in Swabi of journalist Haroon Khan. 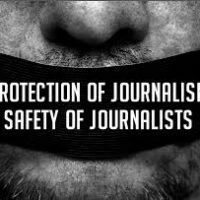 Raising slogans and carrying placards, the protesting journalists called upon the Pakistan Federal Union of Journalists to join them in the struggle to provide security to each journalist. The protesters also condemned the Kohlu police for issuing what they termed illegal arrest warrants against the family members of journalists and closing the press club for no reason.